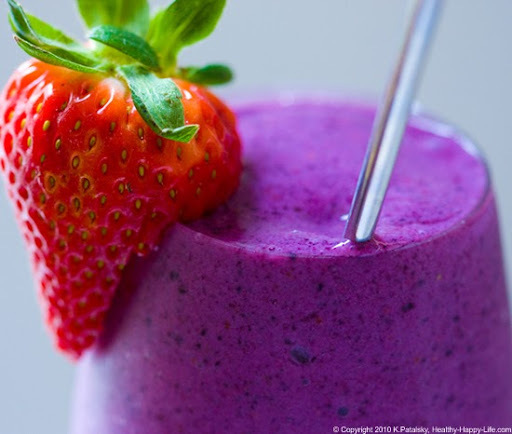 Smoothie moment. Strawberry Banana Soy Smoothie, also called banana-berry. 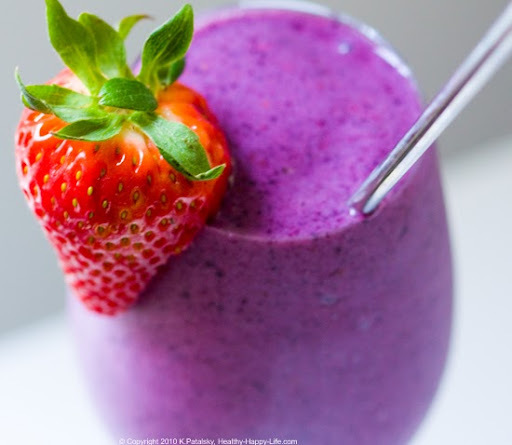 I'm sipping on a creamy, silky smoothie blended up with bananas and berries. How cliche. Sure maybe. But the "Banana Berry" flavor combo is most certainly a classic. And it has longevity for a reason: it's delicious! Smoothie Recipe FYI: ACV A lot of readers will ask me why I put vinegar in some of my smoothie recipes. Well I find the subtle hint of acid tightens and tones the fruity flavors. I only add cider vinegar to smoothies that do not already have an acid ingredient (such as citrus) in them. Soymilk smoothies which usually contain a lot of sweet fruits like bananas and blueberries are perfect for my ACV secret ingredient. But just a tiny touch - don't overdo it! Why the Fresh and Frozen? I like the fresh raw live enzymes that are present in fresh fruits, however I also love the texture of a frozen fruit blend. So I do a combo of the two. 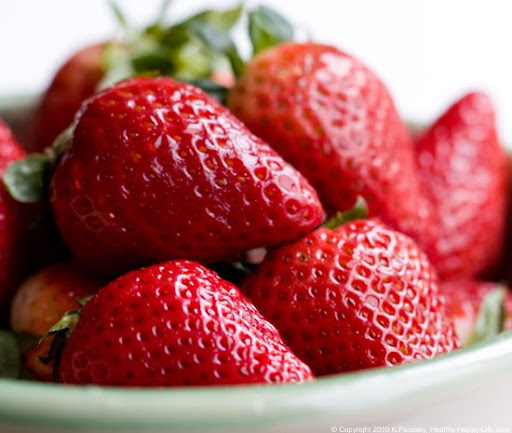 Always add the fresh fruit last in your blend to avoid mushiness. 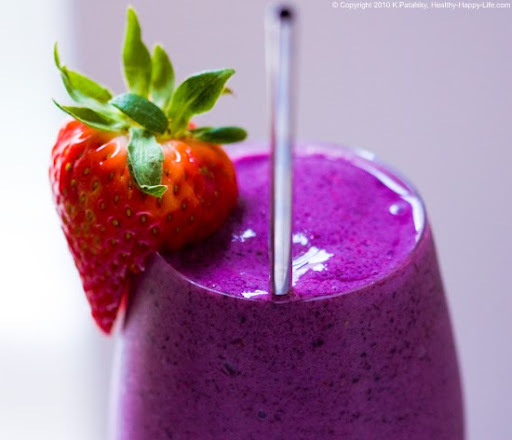 More smoothie tips here. Why Organic? Organic is more expensive than conventional. But for some fruits it is worth it. Like strawberries. Nutrition. This smoothie is rich in manganese, vitamin C, and B12 from the fortified soymilk. It is also a good source of fiber and potassium. You can add a scoop of soy or hemp protein powder to give it and extra boost of vegan protein. Add some flax seeds, chia seeds or flax oil to give it a boost of healthy omega fatty acids! 1. Add the soymilk, frozen fruit, maple syrup, cider vinegar, ice and sea salt to blender. Blend until chunky-smooth. 2. Add in the fresh banana. Blend until smooth. 3. Lastly, add in the fresh strawberries and pulse blend for a few more rounds - you don't want to mush up the berries though. Serve, garnish with fresh fruit! Optional: I like to add a pinch of spirulina powder or hemp oil to my AM smoothies. 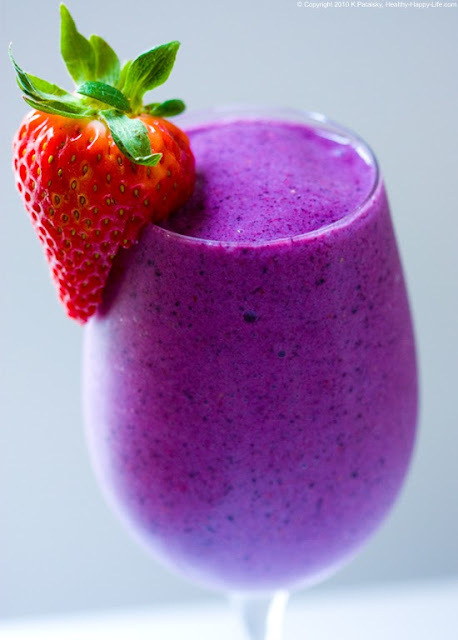 Some raw coconut or raw cashews would also be a nice add-in to give the smoothie a bit more body if you crave it.